Shikhar's repeated insistence and invitations bore fruit as we - me and Chetak - finally planned to attend his marriage in one of the most notorious states of India - Bihar. 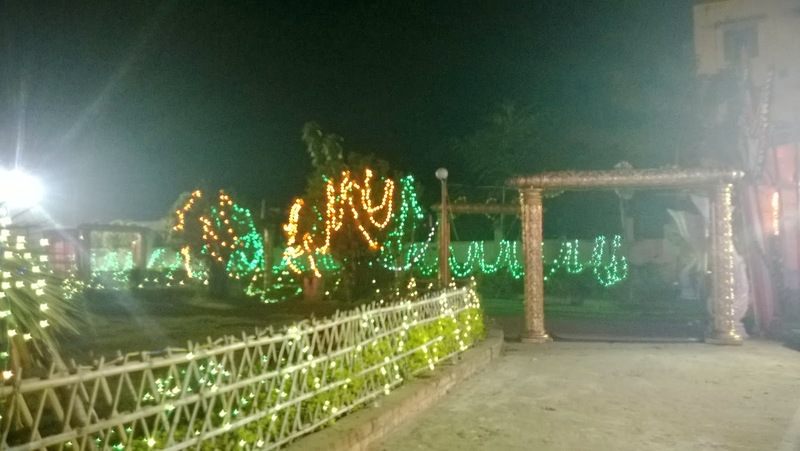 Destination for this seemingly usual wedding excursion was a town named Muzaffarpur in Bihar. It is the fourth largest populous town in Bihar and is known for its sweet or Shahi (as they are locally called) leeches. The place is located 70 km from Patna, the capital of Bihar which usually takes around an hour and half by car. 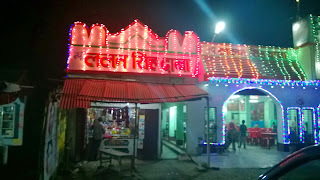 As per the plan, I and Chetak started from the office all ready to catch the Magadh Express (at 8:10 PM on 27th November 2013) from New Delhi station and so began our journey. As my home was quite near to the station, I had planned to pick up my luggage from home while on the way. While Chetak gift wrapped the wedding gift and I finalized packing of my luggage, dad asked me to check the platform of the train’s departure. It was here when the unexpected extension to our journey started. I dialed in the railway enquiry at 139 and the usual IVRS greeted me. After inputting the necessary details it tells us about the train’s status before finally indicating the platform number. And there was a surprise waiting for me - Train number 12402 Magadh Express from New Delhi to Patna Junction scheduled to leave at 2010 on 27 November is running behind its schedule time by 5 hours and 20 minutes and would now leave at 0130 on 28th November. What the delay was of such magnitude that it changed the date of departure – Shocked especially as it was its starting station. Well it is what it is and so it was!! This was only first of what was there to come. 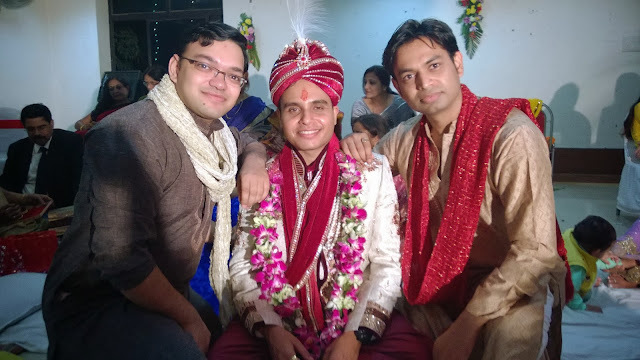 Our original plan was to be there in Patna by 11:30 next morning and in Muzaffarpur in time to enjoy the lunch with Mr. Groom. Now lunch was out of question and so we informed Shikhar about renewed schedule and planned to reach in time for the Ghudchadi – climbing a mare as traditionally groom covers a short distance on it in Indian Hindu marriages. Our belief was strengthened by the fact that trained started on time – I mean the reschedule time of 0130 in morning on Thursday. But well if all plans were to come true, what would be fun in that. When we woke up in the morning – say 11 am – we found that the train was already running behind by more than 6 hours. We were growing cautious of this as we were anticipating that train would make up gradually on the way. However, we remained hopeful to still make to the event. By lunch, I had passed through the city of confluence, Allahabad, for the second time in a week (read more about my previous trip at The Sangam City - Erstwhile Prayag - Allahabad). Meanwhile train kept on its promise of getting late and we were already running late by almost 8 hours and so we again had to have a change in plans. 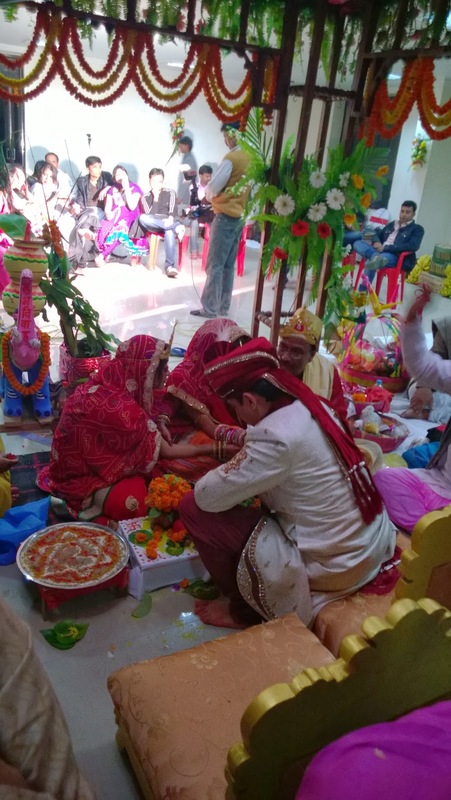 Ghudchadi was already out of question and we were hoping to catch up the varmala ceremony – exchange of garlands between bride and groom, again a tradition – and informed Shikhar accordingly. Well, that wasn’t supposed to be either. After repeated delays amidst unscheduled stoppages, train-passing, station unavailability and other unplanned events, train finally rolled into Patna Junction at 9 in the night. Varmala ceremony was probably already in progress by then and we still were 70 km away from it but we were finally getting off that train and that was sorts of relief in itself. 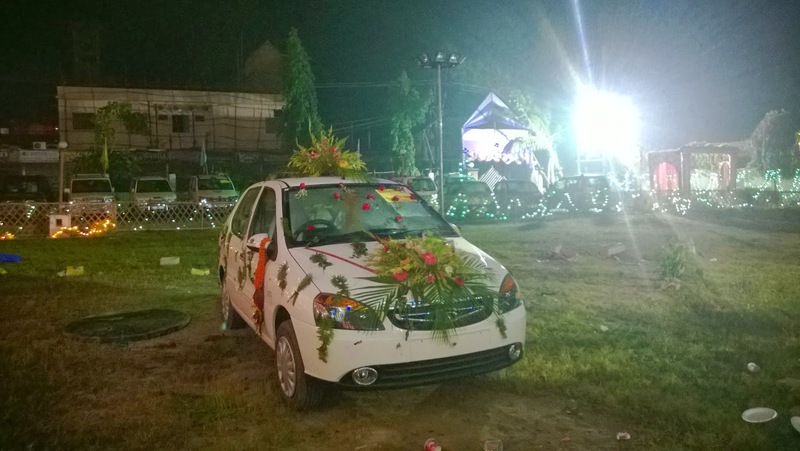 We went to the guest house and freshened up at lightning speed – we were planning to catch up on dinner with the groom if possible or the feras – tradition where the bride and groom go around fire for 7 times and take the wedding vows – and got on the car to start the remaining part of the journey. We had a glimpse of the city while on our way out. I was surprised at how wrong our pre-conceived notions can be about something. I had always thought of Bihar as a land of crime and had imagined secluded roads after sunset. I was really surprised that roads were relatively busy and people were out spending time with their families even at this hour in night. We further rode through the Mahatma Gandhi Setu, which I was aware of as one of the longest bridges in the country being over 5 kilometers in length. Well that 5 km did take its own time to be covered as it was pretty busy with traffic and was relatively narrow. Though we took around half an hour to complete those 5km itself, we were informed of being lucky – lucky to travel 5 km in over 35 minutes … wow - and on requesting for elaboration, driver informed that this bridge commonly witnesses traffic jams of more than 8 hours. And the car ran on the National Highway numbered 77 and we trusted that we would soon be there. Well we trusted a lot since the start so we were to be good enough to know. Car kept moving on past the trucks, around rough patches, across on road dhabas and through the fog settling on the road making it almost impossible to see the traffic on the road. But the problem was it kept running and running and there was no end in sight. The road kept growing in length and habitation, if any, kept moving away from us in the direction we were moving. And we finally lost hope for the dinner and were looking forward to the feras. All we had was a small stop at a Lallan Dhaba – roadside joint – for cleaning up the windshields. 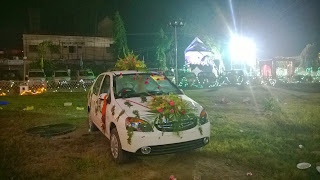 We finally reached the marriage – that was already done – venue half an hour past the midnight almost 24 hours after we started from Delhi. Lucky for us, feras were still to be done and we were now officially guests at the occasion. We were upto making most of our presence now. After a quick dinner and introductions with the family we started on our own masti. We caught up on the events, wished Shikhar and teased him. Then we pulled him in for a quick jig on Badtameez Dil and other bakar. 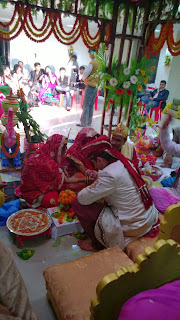 Even though we were pretty late, there were still witness to a number of pujas and rituals – puja of dulhan (bride), puja of dulha (groom), puja of deities, dulha being taken around the mandap dressed interestingly, feras and finally the vows. Being able to attend these were good enough for us to mark our presence to wish our friend for the new upcoming life. The smile on the face of Shikhar as response to our presence there was more than enough to justify the long journey we undertook to be there. By morning the time for vidaai – bride being accompanied away from her home by the groom – was done and after bidding farewell to the family we were on our way back. Lucky for us the return journey was as per the plan and it did not take long before we were back in Patna. After catching up on sleep for a few hours, I was back on the Patna Junction station to board Poorva Express at 1615 to New Delhi. Pleasantly the train started on time and I hoped to be In Delhi by 7:20 next day (Saturday). As there was a part of day journey involved, we were struck by reality of Indian methodologies of juggad and compromise by the daily travelers – unreserved and uninvited –, there to cover a couple of hours of journey to their home after office. One of them was carrying a bud of a plant called Lilium – a flowering plant – and was eager to share about it with the co-passengers. He was really proud of this possession costing him 320 Rupees in local nursery. Another thing we learned was about Karmanasa River – tributary of Ganges near Buxar – which was supposedly the border of Bihar and Uttar Pradesh. Another remembrance from the return journey is the RamPyari – commonly used slang for special tea – from a vendor at Mughalsarai station which was the best tea I had on the journey since I left home. Finally the trained rolled into the New Delhi station right at 7:20 am on time by the minute and I was indeed thankful to be home right in time for the morning tea. I doubt if anyone else would remember this wedding more than us, of course after Shikhar, and all courtesy of Indian Railways. journey planning me trains ka bhi khayal rakha karo....trains like magadh, toofan etc . are notorious for years. These trains are last option types..and need good margin. Could not agree more now that I know the downside of not researching before booking ! !